In the lifecycle of every business, there are going to be plateaus—a point when sales, revenue, or profits lose their momentum and stall. It can be a frustrating experience for any CEO. You’re expected to lead the charge onward and upward, and when progress slows—or worse yet—grinds to a halt, your team will inevitably look to you for answers. In a family business, a plateau can also result in increased pressure from other family members. They need you to find a way out of the current situation – and all eyes are on you. Harnessed properly, pressure can be a good thing. However, when you allow pressure to get the better of you, it can result in poor strategic decisions and reactionary management. The alignment between daily actions and goals becomes lost and you lose your ability to see the forest through the trees—a problem we talked about in a recent post. When you find yourself in this situation, it can be difficult to break through a plateau. So what do you need to change? What actions can you take to bust through them? Your natural inclination is to look at a plateau as something that’s negative. But is that really the case? 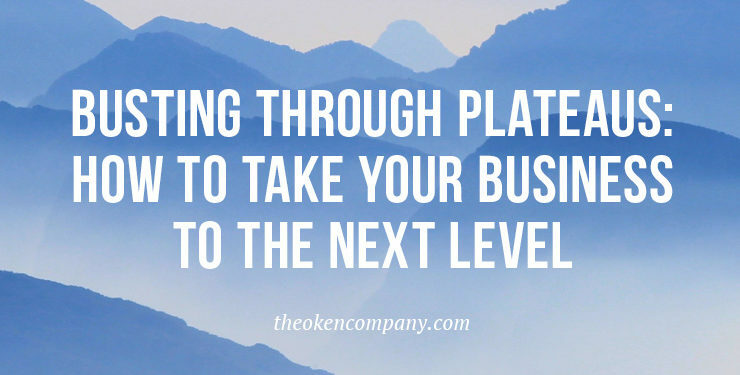 By its very definition, a plateau is a point at which your business has succeeded to a certain point but now needs the next step to continue moving forward. For example, let’s consider the products you offer. All products have lifecycles. When a product matures, sales start to trail off. You’ve reached a plateau. You’ve done something right to get to that point, but if you want to see growing sales from that product again, you need to extend its lifecycle. Companies reach plateaus after periods of sustained growth. They can show up in any part of your business including revenue, sales, customer acquisition, or profits. But remember – it doesn’t mean the sky is falling. Regardless of when or where your business has hit a plateau, its very nature indicates that you have been making progress in the right direction. Plateaus are a natural part of the process, not just in business, but in life. We also see plateaus in the stock market, commodities, our fitness, personal income, and more. They are present everywhere you look. If your business has hit a plateau, now’s the time to launch your next successful strategy. What Causes Your Business to Hit a Plateau? The answer will be different for every business, but a plateau is invariably triggered by either action or inaction. You may have taken an action that resulted in a negative impact on your business, such as pursuing a strategy with poor margins. It can also be the result of failing to take action in response to an external change or circumstance. For example, currency fluctuations could trigger a change in customer buying patterns. The exact location and cause of a plateau are usually evidenced by spending time with your financial statements. The numbers don’t lie. In formulating a solution to a plateau, which we’re going to discuss shortly, it’s important to make sure that you, as the CEO of your company, are focused on treating the cause—not the symptom. Stalled revenues and declining profit margins are not the cause of a plateau. They are the symptom. All too often, CEOs jump head-first into fixing a problem, without understanding exactly why it’s happening. For example, attempting to boost revenues simply because profits have not risen in the last two fiscal quarters is a flawed approach. It’s entirely possible to increase revenues by 50% yet see no corresponding increase in profits, right? You might even see a decrease in profitability. The point here is that you shouldn’t jump to conclusions. Plateaus can be caused by both internal and external factors. Your job as CEO is to work with your team to figure out the true source of the problem and then formulate a plan to push through to the next level. Change. Within your company, and within yourself as a leader. While plateaus can be triggered by an event or decision, it’s often complacency, fear, and lack of change that causes them to be self-sustaining. This can be a problem in a family business where it has become acceptable to maintain the status quo. Family businesses, in particular, require clear lines of communication, chains of command, and defined leadership. If any of these items are lacking, even the smallest change will be met with resistance. Let’s assume that your organization is well-positioned to enact change. What is the best way to approach the situation and how can you increase your odds of pushing through your current plateau? First of all, change for the sake of change is never a good thing. It important to make smart decisions, not reactionary ones. What constitutes a smart decision? Great question. In most situations, smart decisions are based upon hard data, not feelings or hunches. Once you understand the data, you can begin formulating a plan. Identify your areas of strength. What is your company good at and what are you currently doing that is profitable? Do more of what’s working. If you have new ideas, they need to be substantiated, prior to implementation. Identify your areas of weakness or unprofitability. If an obvious solution to the weakness or unprofitability isn’t present, maybe you need to let go of this part of your business or at least decrease or devalue it. Make sure you have the right team in place. This starts at the top with yourself and goes all the way down the ladder. If you don’t have the right team in place, successful execution becomes very challenging. Formulate a plan to pursue your long-term goals and objectives while keeping #1 and #2 from above in mind. Track your progress weekly, monthly, quarterly, and annually. Stick to your plan, measure your results, and adjust accordingly. Even if your strategic plan is fundamentally sound, a poor mindset can derail your progress. Having the right mindset is more important than anything else. Even if your strategic plan is fundamentally sound, a poor mindset can derail your progress and keep you stuck in a plateau. You must be willing to step out of your comfort zone. Being a great leader is a difficult, and often an uncomfortable, role—no one will argue that. You need to have confidence in your abilities to execute and you need to feel passionate about what you are trying to do. You also need to have a plan. We’re not talking about a strategic plan here, you already have one of those, right? We’re talking about a plan to improve yourself—more specifically, the way you’re running your business. What are you currently doing that might be contributing to a plateau, and how will you change it? Are you micromanaging? Are you focussed on the small daily details at the expense of the big picture? Are you reactive or proactive? Could you become a better communicator? There are an infinite number of way in which you can grow as a leader. It’s a process, not an overnight solution. If you commit to enacting positive changes within yourself and your team, your business will follow suit—lead by example. Plateaus are a normal part of any successful business. They offer an opportunity to regroup, reassess, and to formulate a plan for moving forward. When you find your business in a plateau, stop and take the time required to really understand the cause. Look at your business, look at the environment in which your business is operating, and look at yourself as a leader. The only time a plateau becomes an issue is when you turn a blind eye to the underlying cause. Accept that long-term success will require constant change and continual improvement—don’t settle for the status quo. With a little planning and hard work, you’ll be able to put the plateau behind you and resume growth.